Club Penguin Cheats by Mimo777 Club Penguin Cheats by Mimo777: Club Penguin Nowie Awards Nomination! 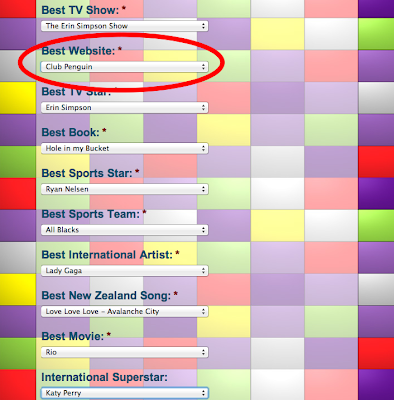 Club Penguin has been nominated for the What Now TV's Best Website Nowies Award in New Zealand! You should check it out! Kinda phunnie some of the choices, if your not from New Zealand area! Hey Mimo!Sup man!I left this blog a couple years ago u r doin well with da blog!Oh yeah im doin a survey about famous bloggers and i chose u! My question for u is hav u ever heard Party Rock Anthem By LMFAO? reply back 2 this comment and tell me the answer 2 my question beacuse its like the most famous sonnng where i liv! Mimo if ur reading this, i wanted to let u know a kool glitch, well maybe not a glitch, that penguins were telling me! ive been seeing penguins with new gingerbread costums and raindeer winter caps! ive never seen these items before and there totally new! So i asked a few penguins who had thses weird items and one of them said it was a glitch and they just clicked a box in the forests like the 18 or the 22 and it opended and they got a kool item! i asked another and they said u must log off cp and go to the german servers and click the box and it will open! I asked one last penguin and he said that since the boxes open everyday, u must change the date on your computer to get the date of the box u want! ive tried these but ive still got nothing! i just wanted to let u know, if u were going to try this, that this is a glitch, well not really a glitch, that ive been seeing and hearing! P.S. if the glitch works for u, plz give me credit, my penguin name is sniffybear2, thx! Your welcome mimo :D btw i watched what now today and they announced the winners. i missed it when they announced the best website award but i will tell you when a find out asap! Anyone else remember when this site used to have like 400 comments for each article? It asks for your name, age, telephone number, and address. Anyone else find that slightly creepy? I watched this this morning on TV! I'm from NZ too,lol Mimo thought the Nowies options were weird. :L Your username freaks me out,I used to post in comments here as MOJOJOJO! I thought mimo wouldve heard that sonng beacause he is epic! and thx to Chrisgeorge for recomendin this blog to me mimo is really as cool as u said ! isnt LMFAO a bad word? hey Mimo. the sports catolog updated. Can you check for cheats? no its a band! dude! I guess it is but maybe it stands for somthing else but anyway even if it did stand for the bad word hes not trying to swear hes just asking something. Lol omg, sorry but did you just ask that? I used to watch What Now, then they changed all the presenters and I stopped when they changed Charlie. Its good to see that they are also nominating Club Penguin as well as hosting competitions to win Club Penguin Toys! I win the wii game from them!